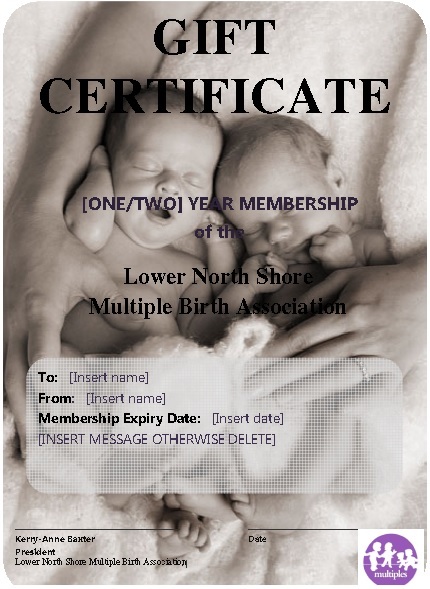 Membership is open to expectant, new and seasoned parents of multiples and families of multiples. Expiration 31/6/2020 and renewal fee is $10. ** Digital Membership Renewal is for full members who move out of the area and want to remain connected with LNSMBA. These members are entitled to access LNSMBA social media groups/forums and receive LNSMBA's newsletters. Already a member with another club in Australia? Did you know you can transfer your membership (including partial payment) to LNSMBA. And also transfer out if you are moving away from the area. Email . We offer 1 and 2 year membership gift certificates. Contact us to find out more.